If you are currently wrestling with a DIY web site, or using a one-size fits none package, as offered through some directory sources, you may experience one or more of the following emotions. Fed up with paying per click for traffic on your web site that doesn't turn into business? Concerned about value for money and return on investment in your website? Frustrated with your site disappearing from the listings when your budget for the day is exhausted? Tired of having to make your own updates and changes? Uncomfortable when writing about your own business? Feeling limited by the system on your DIY site? Paying to advertise other people's work? Then you may find the Village Websmith's Pay Per Enquiry scheme refreshing. Of course, it is still up to you to turn the enquiries into business, but having them should at least give you a head start. Don't want to do your own follow up sales calls? Talk to us. With 40+ years of experience in sales, marketing and promotion, your follow up calls will be in safe hands. All you have to do then is to price the job and issue your quotation or estimate. Pay Per Enquiry - It's time to change the game! It's very easy to generate clicks through to web sites. There are so many practitioners out there, organising clicks through more or less valid campaigns that they are quite literally falling over each other. Generally, there is a cost per click involved, which can be very high in many cases. OK, you can cap your spending on this, but what that means is that once your site has used up one thirtieth of its monthly budget it 'disappears' for the rest of the day. The clicks may come from thousands of miles away, outside your sphere of operations, they may have been clicked by people who are not looking for what you do, or have any intention of doing business with you. They may be curious, they may be confused. Somewhere lost in the midst of the hubub, there may be customers, but they could be few and far between. Let's forget all about clicks for the time being. Let's consider enquiries instead. Real, relevant, viable enquiries that can turn into business for you. They come from an area where you operate, they ask a question about what you can do for them and there is a genuine will to buy. Let's talk about those for a while. In short, let's consider value. Such enquiries are the main goal of every advertising campaign. They open a dialogue that gives you the chance to convert them from questions into orders. The web, being just another advertising medium in this respect is no different. Let's consider a world where those are the only things that you pay for from your web site. They are not merely clicks, they are human beings who want what you do and are prepared to pay for it. They are the reason and the justification for having a web site in the first place. They are the life blood of your business. The Village Websmith's Pay Per Enquiry programme is simple. You get a web site that is professionally built, maintained and updated, using your own graphics, stories and pictures where available. The site is promoted by us through every means at our disposal and the enquiries come in directly to your mailbox. Spam, unmissable offers of fake watches, Russian dates and prescription medicines are filtered out at source, leaving only the meaningful responses from potential customers for you to follow up. You get one monthly bill based only on the number of enquiries received, multiplied by the enquiry value that was agreed at the outset. The only other cost to you is your domain registration, which is annually £15.38 for .uk domains and £25.54 for .com, .info, .net etc..
Just call us on the number above or click in the header of any page to send us an email and get the ball really rolling for your business. 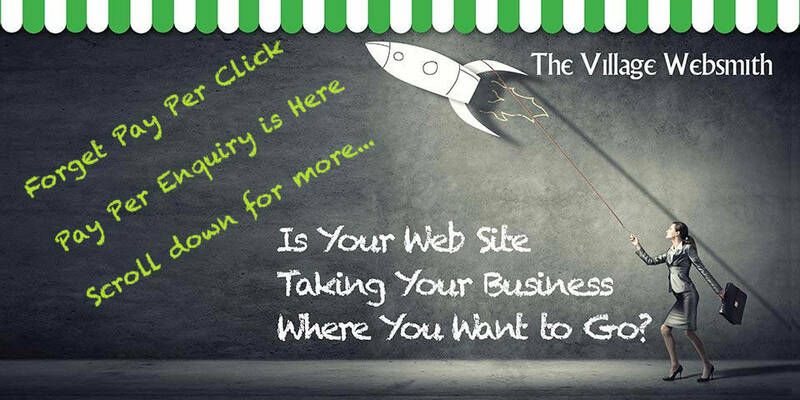 Pay-per-enquiry page, The Village Websmith for prople living in County Durham. small business web design. The Village Websmith operates through franchisees chosen for their marketing and sales ability rather than technical know how. This is the difference and the way that your message can get across to the huge market that uses the internet to find local services in the County Durham area. For people interested in Pay-per-enquiry in County Durham.